In Mandurah we are lucky enough to see dolphins in their natural environment, in the wild. They are not fed, they choose to be here and come and go as they please, on their terms. There are places in Australia that wild dolphins are fed and have now become dependent on humans for food. It is not only illegal to feed wild dolphins but also very dangerous. Studies have shown that by feeding them it will have a negative long term impact on their health and behaviour, leading to a declining dolphin population. There are many reasons why it is harmful, not helpful to feed the dolphins which we will discuss in this article. Firstly, dolphins are hunters, not beggars and by feeding them it alters their natural behaviour. They start to associate humans with an easy meal and may become completely dependent on us for their food, stopping hunting all together. Once they lose this ‘wild’ behaviour it can ultimately result in them starving to death. From the recent studies done by Phd student Krista Nicholson, through Murdoch University’s Mandurah Dolphin Research Project, it has shown that we have a thriving dolphin population here in Mandurah and there has been no sign of dolphins begging for food which is wonderful, making it even more special when we see our beautiful dolphins in the waterways knowing they are truly wild. Below is a video of resident dolphin Nikki doing what she does best, the shallow water tail whack foraging technique. She has passed this successful technique onto her calves, who have then taught their calves. Read more about Mandurah’s dolphins foraging (catching food) techniques on our article ‘A Dolphins Dinner’. By feeding the dolphins it may take them away from the normal areas they spend the most time in, affecting their social groups which may then affect their ability to survive in the wild. They can also learn unhealthy feeding behaviors from one another. Mothers have been seen to neglect their calves, not teaching them the vital hunting skills they need to survive. If the mum is focusing on a free handout, this means she isn’t paying attention to her young, being separated and distracted this leaves the calves on their own vulnerable to predators. From the change in diet the mothers milk may also be of lower quality which could affect the health of the calf. Another reason feeding dolphins is harmful is that over time they will start to lose their fear of humans, increasing their risk of injury, illness, stress or death. They start to spend more time around boats, begging for fish and swimming too close to the boats propellers, increasing their chance of boat strikes. 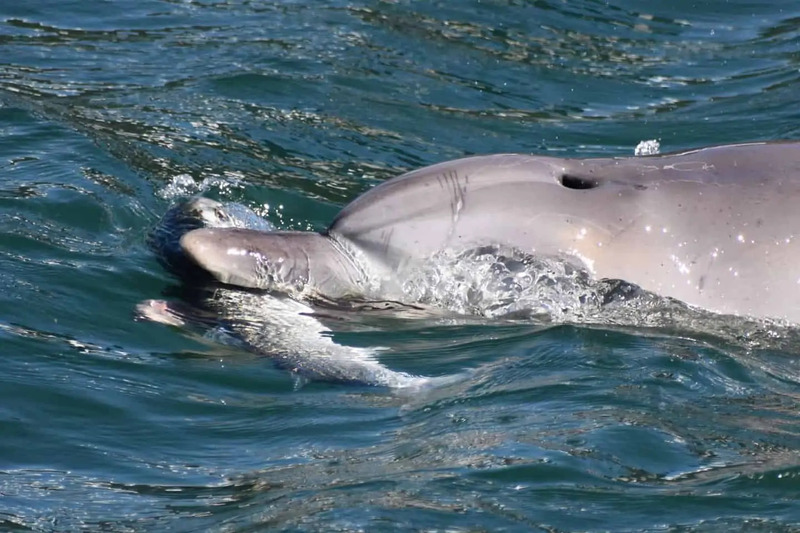 They may even start to steal bait from fishing lines, which is not welcomed by fishermen but also dangerous to the dolphins, with higher risk of becoming entangled or swallowing hooks, lures and line leading to life threatening internal injuries. In their desperation to get fish they also become aggressive. Above: This is “Beggar” a dolphin in Sarasota Bay, Florida. Unfortunately he was loved to death, being fed on a regular basis. Feeding the dolphins can endanger their health by the change in diet or contaminated fish that is not fresh, harmful diseases may be transferred from humans to dolphins and vice versa. If a dolphin approaches a boat, staying close by and moving from one boat to the other, or bringing their head out of the water and opening their mouth waiting to be fed, these are good signs that a dolphin is conditioned to being fed. Please let us know if you come across any dolphins showing any of these behaviours in the Mandurah waterways. As the population of Mandurah increases, so does the boat traffic on the water, leading to more chance of human-dolphin encounters. If you are out on the water and a dolphin approaches you, remember they are wild animals and feeding them can harm their health and survival. We are so lucky to be able to see the dolphins in the wild, it’s one of the beautiful things about living in Mandurah. Let’s continue to enjoy them from a distance and work together as a community to protect our dolphins by not feeding or touching them, keeping them wild to ensure their long term survival so that future generations can enjoy them like we can. If you ever see a dolphin stranded or in distress please contact the Wildcare helpline on 08 9474 9055. Please feel free to ask any questions you may have below and we’ll have our expert dolphin team answer them. To book a dolphin tour with us, click here. Previous Previous post: Wishing Well Record!